Charged with middle child syndrome; verdict: guilty of being an aimless, but certainly not boring, sequel in a YA franchise. 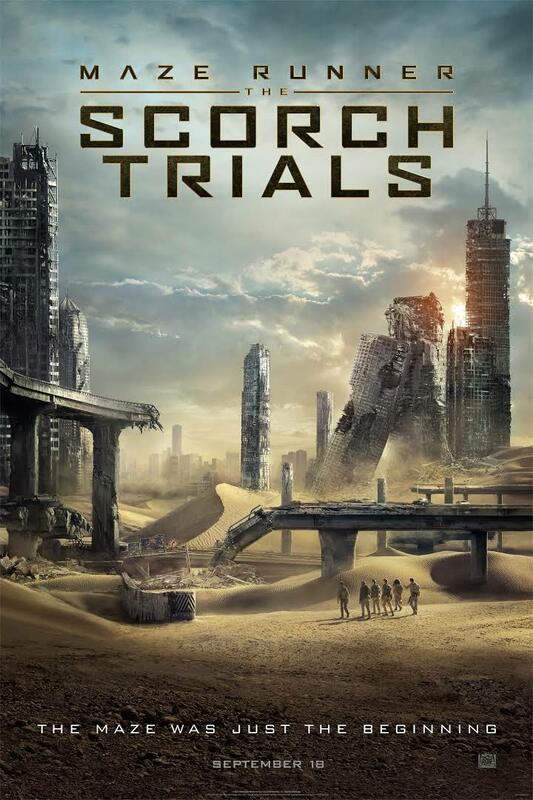 Maze Runner: The Scorch Trials is an exciting second chapter in the Maze Runner trilogy. Unfortunately, the non-stop action and thrilling nature of the movie is paired with a mediocre plot frocked with a lack of narrative direction, character development, and exposition. No doubt, the movie is far more entertaining than the first one; however, it just plays off as a filler movie with little to offer up in the way of supporting and moving the story along. Although we finally get a closer look into WCKD and what their goals are, there is still no explanation as to why a maze or how some are immune to the scorch virus and others are not. I suppose we have to wait for the third movie to find that out. In terms of sequel quality, this falls somewhere between Insurgent and Catching Fire. I feel the biggest problem with similar movies is that it perpetuates the idea that teenagers are extra special and adults don’t/refuse to understand them (although, these guys are clearly in their 20s). Maze Runner: The Scorch Trials takes place right after The Maze Runner as our group of guys and girl are rescued from the maze. Dylan O’Brien reprises his role as Thomas, the courageous leader, and attempts to adjust to his new surroundings. Thinking that WCKD is behind them Thomas meets Aris (Jacob Lofland) and discovers that all is not as it seems in their new home. After witnessing teenagers leaving and not returning, Thomas and Aris lead our glade survivors on a mission to break out of the facility. Nearly stopped by the leader of the facility Janson (Game of Thrones’ Aidan Gillen), Thomas and his friends escape the clutches of WCKD once again. Only this time instead of the lush glade, they are confronted with an unforgiving landscape of scorching sun and towering sand dunes. After encountering zombie-like creatures, Aris and Thomas lead the group toward the WCKD resistance in the mountains. Despite defeating the ravenous creatures from the maze and once again escaping from WCKD, nothing has prepared the group for what lies in the desert. The best feature this woeful sequel has going for it is that it is never boring. From the moment the movie opens to the time it closes, you will probably never yawn and even jump from time to time. Think about this installment as I am Legend meets The Hills Have Eyes meets The Divergent Series. There is even a scene that looks like it leaped right out of the trailers on The Lost World: Jurassic Park. I’ve often commented that sequels in a trilogy are required to be the meat of the series. It often should include the backstory, exposition, and character development needed to launch the series into the final chapter. In many ways, The Scorch Trials is an efficient sequel in the YA franchise, but it lacks the inspiration required to be a good or great sequel. Excellent examples of sequels that were both effective and inspirational are The Empire Strikes Back, The Two Towers, and The Prisoner of Azkaban. I was hoping to see some growth amongst the characters, but all of them pretty well seemed to be just as they were in the first film. One of the fun ways to approach typical YA movies is by reading them as depicting real-world situations as an analogy. Caution: this may give away a reveal in the movie a little, but I feel that this movie can be read as social commentary on the current state of the U.S. social security dilemma. Won’t go into anymore detail than that because I do not want to spoil one of the turning points. Not that YA movies provide answers to real-life problems, but they can often allow us to look at hot-button sociopolitical topics from new perspectives. Another positive element of this genre is that it has inspired young adults to read who otherwise may not have desired to read for pleasure. Beyond the pages of the books that inspire YA movies, the movies are often produced in such a way that they are fun to watch no matter if you are 15 or 45. Even though I don’t feel The Scorch Trials was a great sequel and showcases obliquely motivated characters aimlessly moving from one place to another and very little actually advances the plot or shows direction, it is a fun movie to watch and will definitely keep you entertained for the more than 2hr runtime. Unsure as to why 20th Century Fox chose mid-September for the release of this movie that feels like it should have been released in May, it is definitely one to catch in theaters because it will lose a lot of its appeal on the smaller screens in our homes. Be sure to re-watch the first one because it picks up right where the previous one ended. Oh yeah, you’ll definitely like the high caliber visual and special effects that are usually not associated with this genre.